A frame style is selected by checking the radio button which corresponds to the desired style. Options are also provided to frame the selected area with some other character, and either the ANSI Chart or OEM Chart can be summoned to assist in character selection. 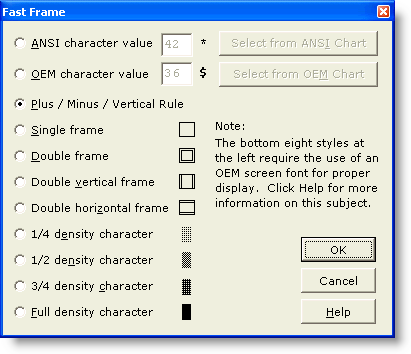 When using an OEM Screen Font, several additional frame styles may be used. The bottom eight styles offered in the dialog box require the use of an OEM screen font for proper display. The ANSI character set does not contain these characters, so using these styles with an ANSI Screen Font will produce undesirable results. Once OK is clicked, the selected area is automatically framed with the chosen frame style. The frame is applied to the outside of the selected area. If the left edge of the selection lies in column one, the lines in the selected range will be pushed right by one column to make room for the frame. If Tab characters appear within the selection, they will be automatically converted to Spaces to ensure proper display after framing. When printing files which contain drawing characters from the OEM character set, be sure to use a Printer Font which also uses the OEM character set.